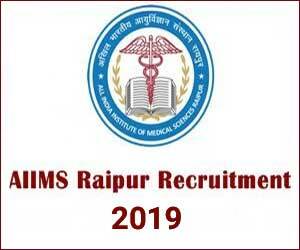 New Delhi: AIIMS Raipur has released a notification for 141 vacancies for the post of Senior Residents on Contractual Basis. The Selection will be made on the basis of Interview. AIIMS Raipur is an apex healthcare institute, established by the Ministry of Health & Family Welfare, Government of India under the Pradhan Mantri Swasthya Suraksha Yojna (PMSSY). Last date for Apply: 05-02-2019. Interview for these posts is tentatively scheduled to be held on 7th and 8th February 2019 in the premises of AIIMS, Raipur. The Vacancies are in the department of Anatomy, Biochemistry, Burns & Plastic Surgery, Cardiology, Cardiothoracic Surgery, Dentistry*, Dermatology, Endocrinology and Metabolism, ENT, Forensic Medicine and Toxicology, Gastroenterology, General Medicine, General Surgery, Microbiology, Neonatology, Nephrology, Neurology, Neurosurgery, Nuclear Medicine, Ophthalmology, Orthopaedics, Paediatric Surgery, Paediatrics, Pharmacology, Pathology & Lab Medicine, Physiology, Physical Medicine and Rehabilitation, Pulmonary Medicine, Radio diagnosis, Transfusion Medicine and Blood Bank, Senior Resident-General Surgery (Trauma & Emergency), Senior Resident-General Medicine/Emergency Medicine (Trauma & Emergency), Senior Resident-Peadiatric (Trauma & Emergency), Urology. 1. A post graduate Medical Degree/Diploma in respective discipline from a recognized University/Institute. 2. DMC/DDC/MCI/ State Registration is mandatory before joining, if selected. Upper age limit 37 years. Rs. 67700/- (Level-11, Cell No. 01 As per 7th CPC) plus usual allowances including NPA (if applicable).